The SI-TEX MDA-3 AIS Antenna Splitter provides signal gain, improving AIS reception and range. 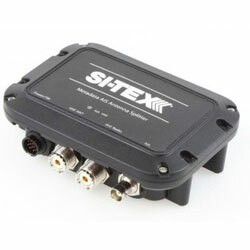 The SI-TEX Antenna Splitter is an Intelligent device that allows both the VHF Radio and any AIS Device connected to receive signals simultaneously. Allows the use of the primary ships VHF antenna for both VHF radio and the AIS transceiver. Eliminates the need for 2nd Ant. When either the AIS transceiver or VHF radio transmits, the AIS antenna splitter automatically senses the transmission and routes the signal to the antenna. If the VHF radio is transmitting when the AIS transceiver wants to transmit the SI-TEX AIS antenna splitter will give priority to the VHF radio and allow the AIS to transmit as soon as the VHF radio transmission ends. The Antenna Splitter has a fail-safe mode that allows the VHF radio to operate normally in case of a power failure.